My wife and I love this cigar. It has great taste, smokes easy, very nice cigar for a nightly smoke. Bestcigarprices.com stand by their products. Arturo does too. 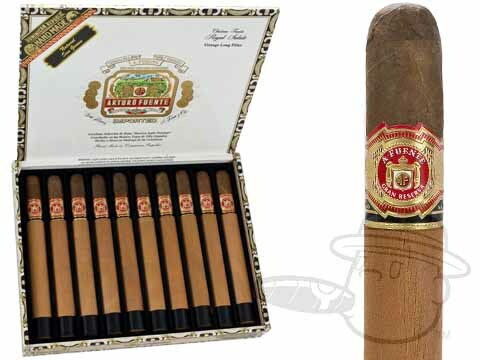 I have smoked my share of Fuente Royal Salute Natural and Maduras but never tried the Sun Grown. Was looking to order a box on Naturals but they were on back order. Gave the Sun Grown a shot and I may never go back. Smooth, great draw with a bit more flavor and spice then the Natural. I have trouble with stronger cigars but this one caused no ightheadedness or willies. Well constructed in the Fuente tradition, I will enjoy these and order more. This cigar is very enjoyable after a great meal. It burns and draws perfectly. This is a stock that you have to have time to smoke. The Cameroon wrapper enhances the flavor. This is one of my favorite cigars. Arturo Fuente Royal Salute Sun Grown is rated 4.4 out of 5 based on 5 customer ratings.